ITEA project DIAMONDS won the prestigious EUREKA Innovation Award 2016 in the category ‘Added Value’ and the Project Pitch Prize during the EUREKA Innovation Week in Stockholm on 27 April. DIAMONDS project leader Prof. Dr. Ina Schieferdecker received the award from Per Tervahauta, Chairman of the EUREKA High Level Group. In the morning of 27 April, the ITEA project DIAMONDS was announced as the winner of the EUREKA Innovation Award 2016 in the category 'Added Value'. A winning project was announced for each of the three categories 'Competitiveness', 'Added Value' and 'Innovators of tomorrow'. These three finalists then took part in a contest for the best project pitch, ultimately won by the DIAMONDS project. The DIAMONDS (Development and Industrial Application of Multi-Domain Security Testing Technologies) project, led by the Fraunhofer FOKUS (business unit System Quality), was carried out by a consortium of 21 industrial and scientific partners from Austria, Finland, France, Germany, Luxembourg and Norway from October 2010 to May 2013. In several industry case studies, DIAMONDS has evaluated efficient and automated security testing methods of industrial relevance for highly secure systems in multiple domains (e.g. banking, transport or telecommunication). Prof. Dr.-Ing. 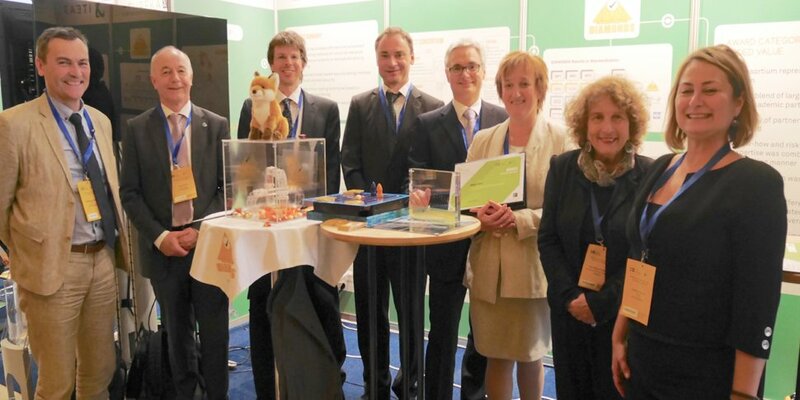 Ina Schieferdecker, Project Coordinator of DIAMONDS and Director of the Fraunhofer-Institute FOKUS is very pleased with the EUREKA Innovation Award: "This award honours our work and that of our project partners for model-based security testing within DIAMONDS. Its innovative methods and tools obtain enhanced visibility. We want to use it at Fraunhofer FOKUS to strengthen the importance and dissemination of security-oriented testing methods and to develop further innovative approaches by the System Quality Center. Thank you also to ITEA and the EUREKA Network for their support." Jury Chairman Peter Lindberg, Programme Manager at Sweden's innovation agency Vinnova, explains: “The ITEA DIAMONDS project won the category 'Added Value' for having successfully developed and implemented a new model-based testing and monitoring paradigm for security testing of networked software systems."